We’re proud to present our line of fine wooden marionettes, animated wooden sculptures to delight, entertain and amuse. Sturdily constructed of hardwood, felt, fabric and leather, all of our marionettes achieve an exciting, magically realistic movement with a simple, one-hand operation. 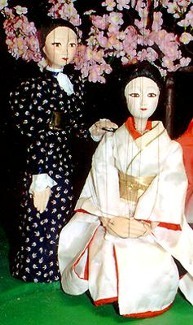 The marionettes are rich in color and generous in size (sizes noted in the pages that follow are vertical measurements of the marionettes themselves, without strings and control-bar). Should they ever become tangled, they feature a unique, tangleproof string design that makes untangling a snap. These remarkable ‘Motion-Sculptures’ operate fluidly in 4 real dimensions. All styles come attractively packaged with simple operating instructions included. As an option, the hardwood Display-stands pictured with the marionettes keep them neatly displayed and ready for action. We are forever grateful to Ted Leach, founder and director of the New England Marionette Opera, for his gift to us of the name 'marionettes.com' . Under Ted's direction, the New England Marionette Opera quickly grew to become one of the foremost marionette productions in the world. Then, on January 1, 1999, this great company came to a sudden and tragic end when a fire destroyed his theatre and nearly all of his hand-made marionettes, controls and equipment.